After completing my first quilt I realized I needed a little more help than just doing general internet searching and reading books. To improve my skills I needed someone to teach me and You Tube came to the rescue. I found a video for a Disappearing Nine Patch block by Jenny Doan from the Missouri Star Quilt Company. 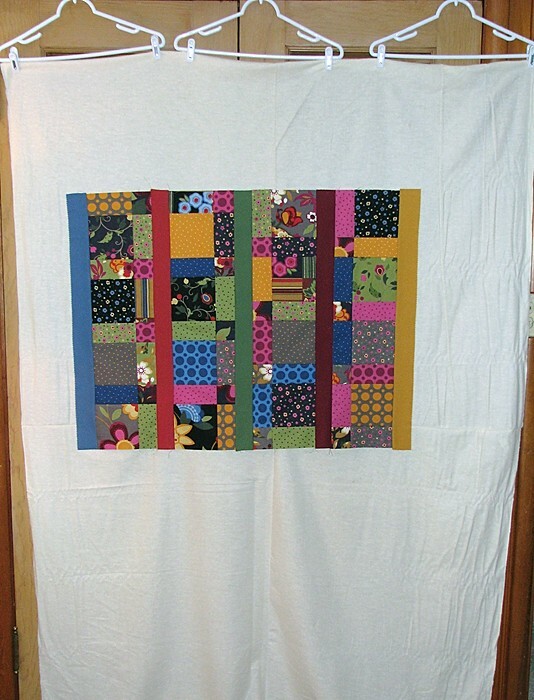 I was intrigued with not only how easy and versatile this block was, but the fact you could use pre-cut fabric bundles called charm packs to make a quilt. Less cutting required by me! So off I went to the quilt shop to get charm packs. Another lesson learned; I can’t go to the fabric store and just get what I need for one quilt. For my original quilt idea I bought one charm pack from Moda called Rooftop Garden, some complimentary solids, and another pre-cut pack of solid colored strips called a jelly roll. But I also came across some beautiful batik dyed fabrics that I just had to have so brought those home as well. I loved the batik fabrics so much I decided to cut squares from them to tackle my first version of a Disappearing Nine Patch quilt. 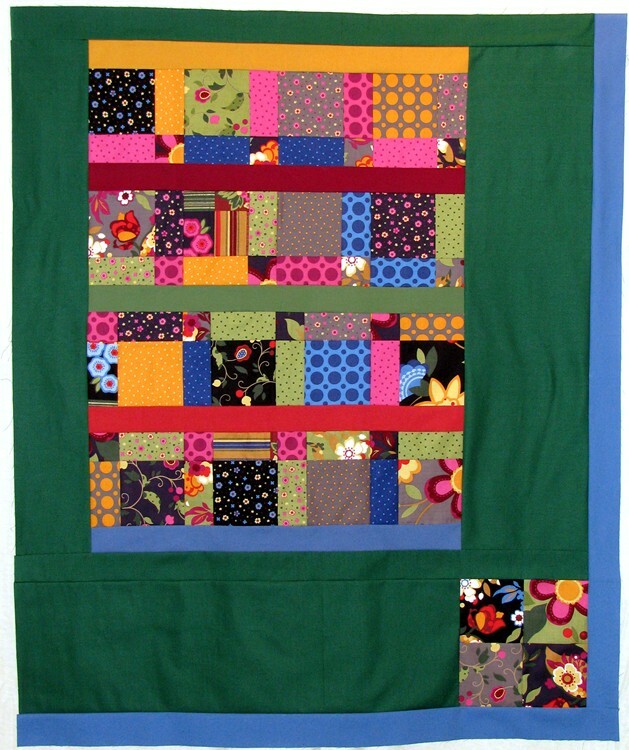 Once I sewed my first nine patches together however, I didn’t want to cut up the block! I really liked the full effect of the nine patch block so left it alone and designed a completely different concept; three large nine patches, sashing and side panels. Plus, I really loved the multicolored fabric that had a tree limb type design, so wanted to avoid cutting that up too much. This quilt was bigger than my little baby quilt. Since my design was not from a pattern I needed to be able to play with the block arrangement to determine the most pleasing lay out. I soon discovered that laying blocks and sashing on a table, bed, or the floor wasn’t the best solution. My cats were far too helpful with all that fabric easily within reach and the perspective wasn’t that great either. I needed to be able to step back from the layout to really determine if it worked for me. I knew that cotton fabric would “stick” to muslin or flannel when pressed against it. However I have no wall space in my sewing room so I could not just tack up a sheet of fabric on which to arrange my blocks. Instead, I hemmed a large sheet of muslin with drapery weights at the bottom then hung it over a closet door. Not wanting to damage my vintage knotty pine paneling, I used Command hooks attached on the wall above the closet and used hangers with clips to hang my sheet of muslin. That also allowed me to easily take the “wall” down and get it out of my way when needed. This would do for now. Unplanned quilt designs can lead to the lack of the right amount of fabric. 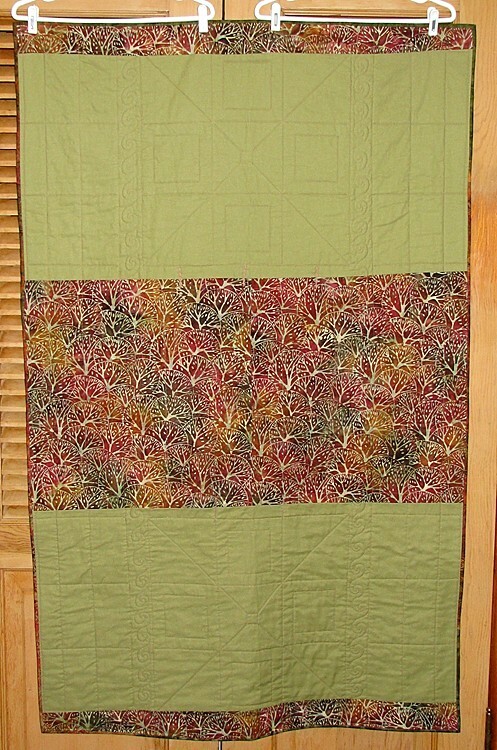 I finished my quilt top during the early evening and discovered I did not buy enough fabric for the backing. It was too late to run to the local quilt shop for more. Since I was too impatient to wait until morning and I had leftovers from the sashing and border fabric, I decided to combine two different fabrics to make the back. I liked it! Now I’ve learned that other people actually do that on purpose. It can add an unexpected design element. Time for the quilting. I can sew a straight line but I wanted to get more creative than with the baby quilt. 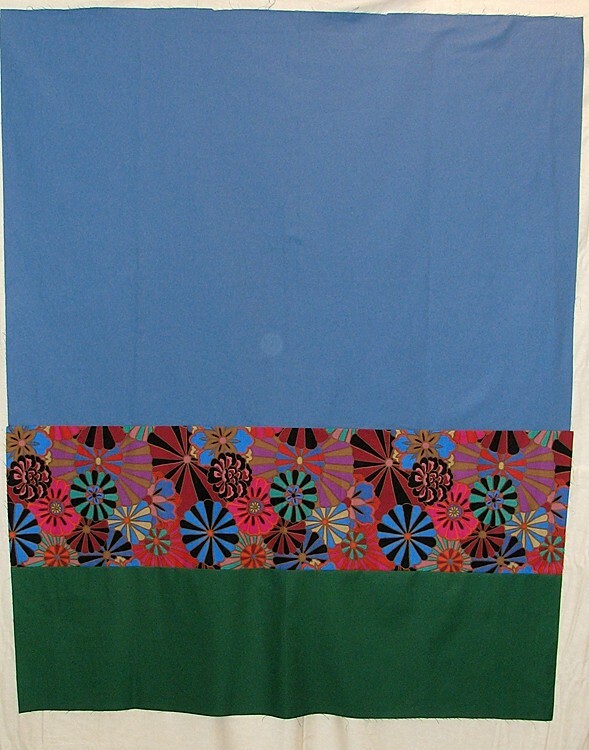 I stitched in the ditch to stabilize everything with the plan to sew different geometric patterns within the quilt. 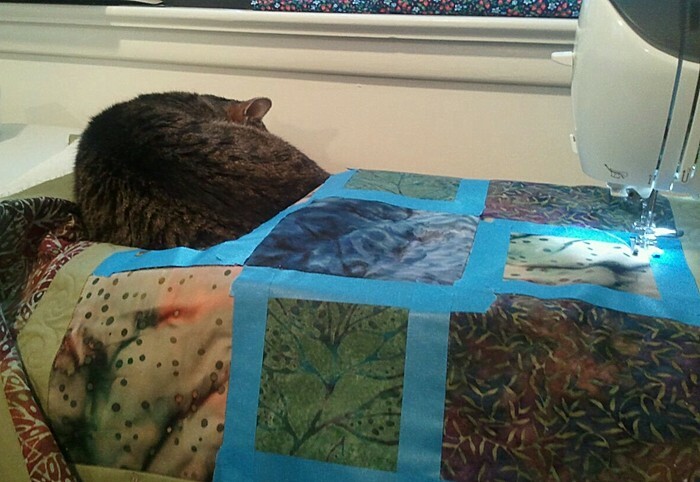 But I was worried about how to properly mark on the quilt to draw out designs. Since I’d done my fair share of painting walls over the years, I knew painters tape worked well for helping with wall designs. So instead of using a marker I grabbed some painters tape and laid out some potential patterns. I lined up the edge of my sewing machine foot with the edge of the painters tape and started stitching. It worked great. 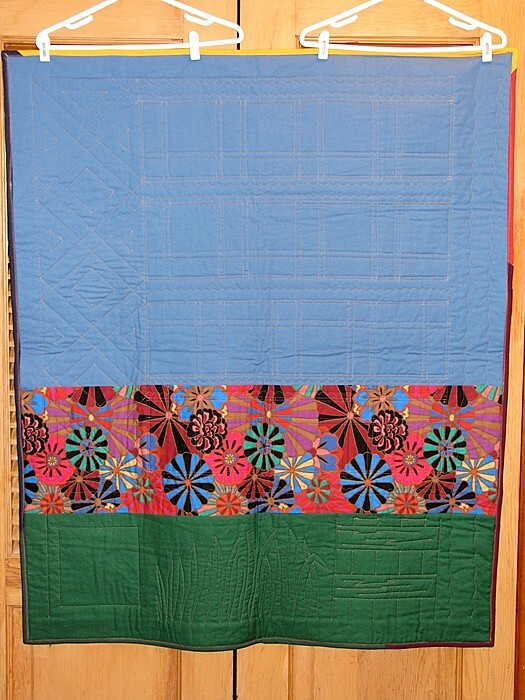 I taped out different parts of the design at different times so I would not have a bunch of tape all over the quilt. 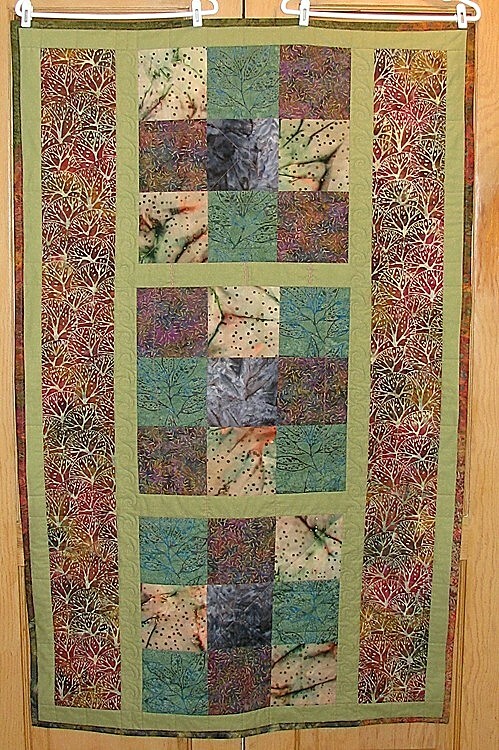 After I sewed one group of lines I re-positioned the tape and sewed more, continuing that process as I went along. This is the only photo I have of those past efforts but I think you can get the idea. 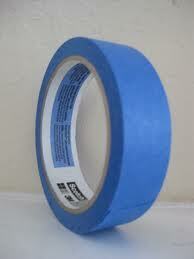 Painters tape comes in a variety of widths, does not leave a residue, can be re-positioned and used multiple times, and when it loses its stickiness you just grab more. The pictures show how I ended up arranging them in rows separated by strips. I added an offset four patch as well and I left a lot of negative space with big sections of solid fabric to give me room to practice quilting. The back was pieced on this one too. 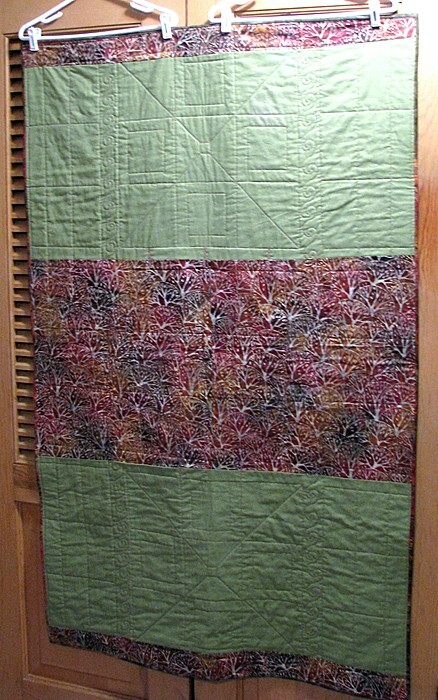 Below is the end result after quilting. Using my painters tape at times and trying to “draw” with my needle (not free motion, just gentle curving lines) I have a variety of things going on! Plus I used some of my sewing machine’s built-in decorative stitches in some areas. 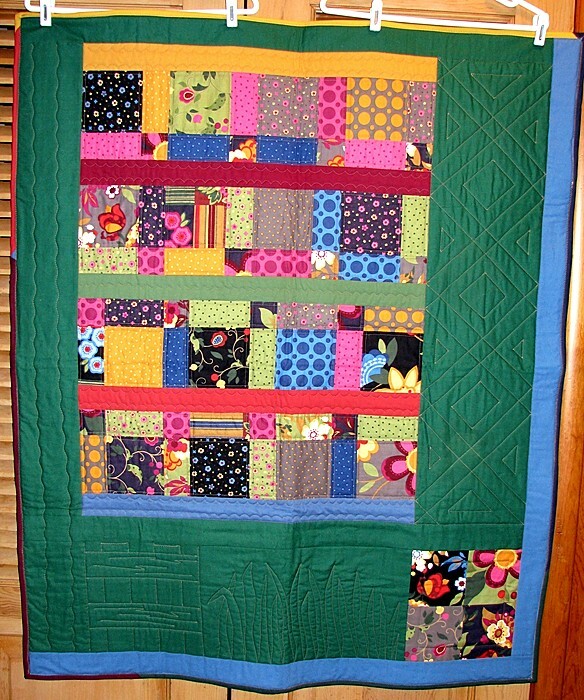 I really had no design theme I was trying to achieve with the quilting. I just wanted to play around with different ideas so this was definitely nothing more than a practice piece. After tackling these two quilts I also learned Jenny Doan was teaching video quilting classes on Craftsy.com. I signed up, and continued to sign up for more classes. If you haven’t heard of Craftsy and their great online teaching platform, I encourage you to check it out! This is an excellent and well written tutorial. How brave and generous of you to share your experiences, thought process, resources and creativity with us.